How do you get the best mobile users? That's a question thousands of app publishers ask themselves daily. We have the answer. If you build the best app in the world, it's going to be wasted if no one ever finds it. But there is a virtual sea of mobile apps out there, each clamoring for the attention of those top users -- the ones with the great attention spans or the deepest pockets. Most consumers will only tolerate so many apps on their phone -- that means yours has to really count. Mobile ad spending doubled last year and top apps are spending anywhere from $4 to $30 per user for fresh users. VB Insight took a hard look at mobile user acquisition -- the major players, the best strategies and the top user acquisition companies. We surveyed 731 mobile developers with over a billion users among them. We also studied data summarizing the results of almost 14 billion mobile ads, and talked to leading user acquisition experts. And now John Koetsier is going to give a first look at the data -- for free. We'll also talk to two experts in the field of mobile user acquisition and get their real world take on a very tempestuous arena. Your mobile strategy can't afford to wait another day -- don't miss this vital information and free interactive web roundtable. 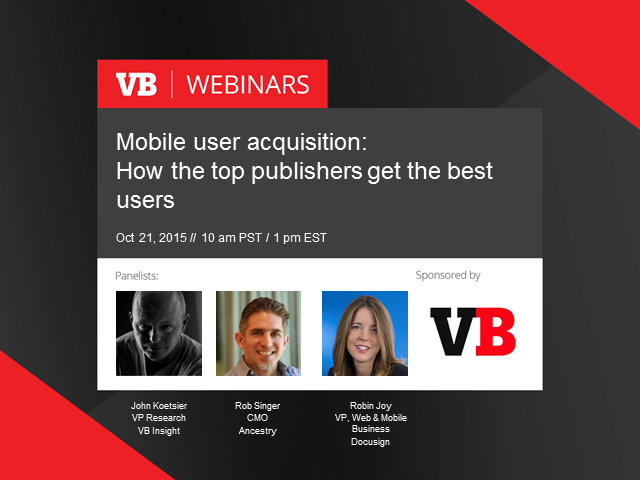 This webinar will be based on John Koetsier’s VB Insight report "Mobile User Acquisition: How top publishers get the best users for less money", which was published Sept 10, 2015. This is independent analysis and vendors did not have any influence on the outcome of this report.